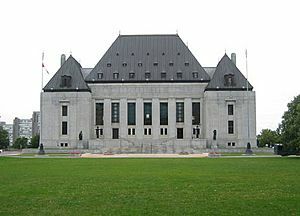 A court is a form of tribunal, often a governmental institution, with the authority to adjudicate legal disputes between parties and carry out the administration of justice in accordance with the rule of law. Courts are the central means for dispute resolution, and it is generally understood that all persons have an ability to bring their claims before a court. Similarly, the rights of those accused of a crime include the right to present a defense before a court. The system of courts that interpret and apply the law are collectively known as the judiciary. The place where a court sits is known as a venue. The room where court proceedings occur is known as a courtroom, and the building as a courthouse; court facilities range from simple and very small facilities in rural communities to huge buildings in large cities. Court Facts for Kids. Kiddle Encyclopedia.